Self-reinventor. Master of self-aggrandizement. The first blogger. An enigma shrouded in a white suit. These are just a few of the labels that have been applied to Mark Twain since UC Press announced it would publish his uncensored Autobiography 100 years after his death. In celebration of this important milestone and in honor of our cherished tradition of publishing Mark Twain’s works, UC Press is proud to announce the release of the Autobiography of Mark Twain: The Complete and Authoritative Edition, Volume 1. 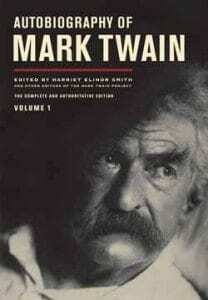 View materials only available at the Mark Twain Project archive at www.thisismarktwain.com. Read an excerpt in Newsweek. See pages from the Autobiography with glosses by general editor Robert Hirst at Granta. Buy tickets to Litquake’s Mark Twain Ball November 4.